Today’s single mothers are much more likely to have never been married than were their counterparts in the past. 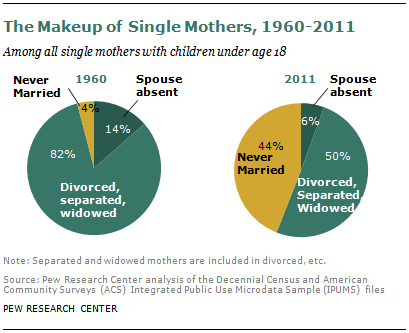 In 1960, of all single mothers, more than eight-in-ten (82%) were divorced, separated or widowed. An additional 14% were married, but their spouses were not living in the household. Only 4% of all single mothers had never been married. By 2011, the share of single mothers who had never been married had reached 44%, while half of all single mothers were divorced, separated or widowed, and 6% had an absent spouse. These patterns are tied to broader long-term trends in non-marital births and divorce. According to data from the National Center for Health Statistics (pdf), the share of births to unmarried women rose to 41% in 2010 from 5% in 1960. And a recent Census Bureau report (pdf) shows that in 2011, 36% of mothers who gave birth in the preceding year were unmarried; a majority of these women (87%) had never been married. The share of mothers who are divorced, separated or widowed increased in the 1960s and 1970s and has remained relatively stable since 1980, hovering around 12% to 13% in the past three decades. In the past five decades, the share of never married mothers among all families with children has increased from less than 1% to 11%.